A beach-bum from the start, Sherice finally escaped the dry and desolate landlocked region of Northeast Denver for the shores of North Carolina. There she is deeply committed to her husband Andy and invests the majority of her effort into their 3 children; Sawyer(11yrs), Asher(5yrs) and Eden(1yr, you may hear her cooing in the background as you schedule a cleaning). Once her little ones are a bit older Sherice plans to turn her passion for women's development and midwifery into a career as a doula or midwife. Born and raised in Arvada Colorado, Peter has now been with Sonlight for 8 years. Aside from performing his managerial duties with excellence, Peter is known for setting the crew record for the most consecutive days to eat a Chipotle burrito. Occasionally he will even eat two in the same day. Outside of Sonlight, Peter is actively developing a career in photography. Check out his work at instagram.com/peterjames2050 or at peterstephensphotography.com. Video production, climbing, welding, coffee roasting and all things "outdoors" are just a few of his many interests. Never to be defined by his ambitions, Seth can only reveal that in 5 years he sees himself "on a yacht". Moving from his hometown of Houston and marrying his wife Maggie just last year, Joey first joined our operation in the spring of 2017. He has since successfully conquered a lingering fear of heights. Outside of Sonlight Joey tends to make a lot of music. Currently, he plays drums and accordion for "The Oh Hellos" (theohhellos.com) as well as several other local bands. As if he wasn't busy enough already, Joey is also pursuing a career in voice acting. Pasco had moved from Congo to Tanzania to Denver, all before turning 15, so suffice it to say, the man has seen some sights. 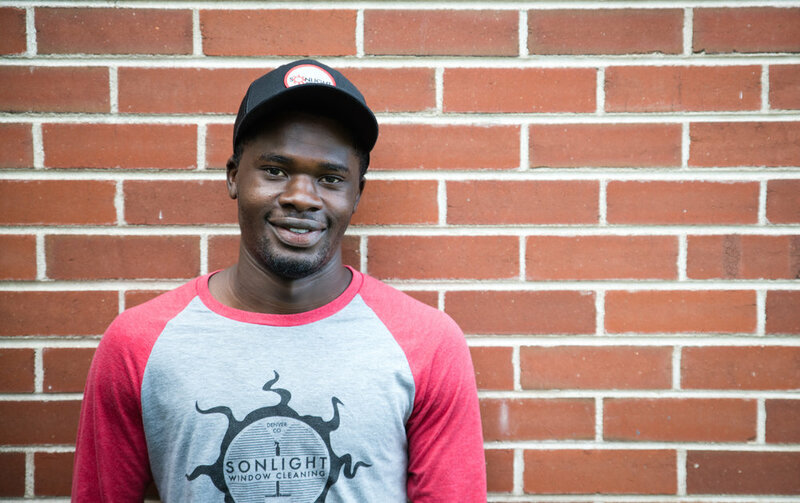 Despite his fluency in Kirundi, Swahili, French and English, Pasco is seeking even more education as he pushes forward in the application process at MSU Denver. A life long soccer player, we're rooting for his success in obtaining a walk-on spot on one of the MSU-Denver teams. Abel, along with his family, left his home in Addis Ababa Ethiopia and settled in Denver in 2009. Since then Abel has focused on his studies. Mastering english, graduating high school, and now nearing completion of a Mechanical Engineering degree at University of Colorado Denver he has high hopes for putting his mind to work in the automotive design industry. An army brat in his youth, then touring with his former band "Sound The Ruin", and now the bassist for local band "The Night Queens"; Grant is a man well accustomed to being on the road. Grant's 10 year plan culminates with the self-construction of his own home on his own piece of land somewhere in a rural America. Originally from the suburbs of Baghdad, 'Abdu', as we call him, settled in Denver in 2012. Though currently overcoming a wrist injury, he plans to rejoin the crew as soon as he is healthy. In the mean time he continues to pursue a degree in Physical Therapy at MSU Denver. Abdu draws his interest in the medical field from his life-long experience as a soccer player and from his grandparents who were pharmacists in Baghdad. Originally from Congo(Brazzaville), Geoffrey spent the majority of his youth in France. Geoffrey is famous for having once flown to China and back over a 2 day weekend just to celebrate a friends graduation (he was on time to work despite the jet lag). Just 1-2 years away from a bachelors degree in Mechanical Engineering at MSU Denver, this Parisian-American sees himself eventually getting his masters degree and working in the aviation industry.